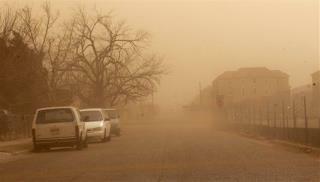 2nd Dust Bowl Headed for American West? (Newser) – The American West might be in for another Dust Bowl as massive dust storms are on the rise, according to a study out of Aeolian Research. While the area is known for its often dusty visage—think all the Westerns you've ever seen—drought and high winds are causing more storms than usual, and that's only half the problem. "The other half [of storms are] unexplained," one study author tells National Geographic, pointing to "off-road vehicle use, oil and gas development, urban and rural development, and grazing" as possible causes. I don't believe it is happening. It is a liberal/scientist conspiracy against apple pie and America.